Roof moss, Lychen and algae are all living organisms which only require moisture and minute quantities of minerals to allow them to grow. Moss and Lychen grow on virtually any roofing material or surface and as well as being unsightly, their root systems have the ability to bore into solid slate or roof tile up to 12mm thick, therefore once established on tiles they allow the passage of water to get into the sub straight of your roof which gives rise to frost attack and shaling of tiles or slate which will become very detrimental. Moss and Lychen will grow up under the over lap of tiles or slates and cause capillary attraction of rainwater eventually resulting in roof leaks. heavy roof moss contamination soaked by rain will considerably increase the weight load on a roof and once established these colonies lead to the rapid deterioration and breakdown of roofing materials eventually necessitating in costly repairs. 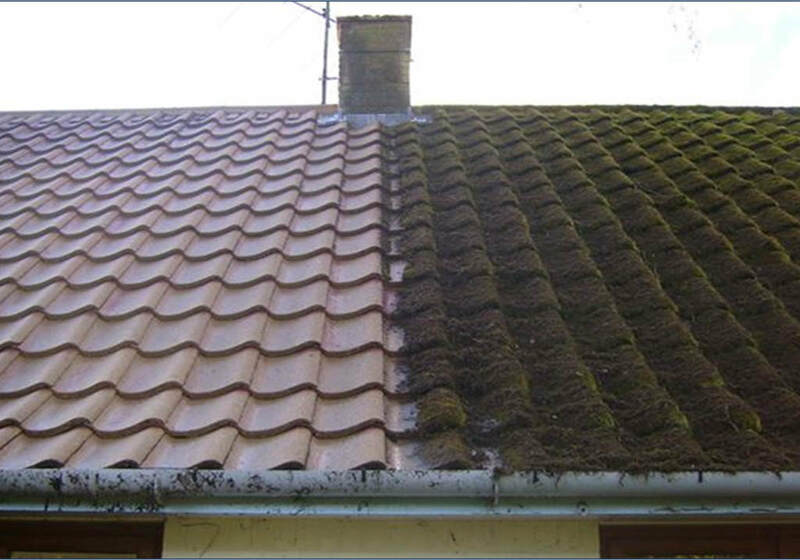 We provide a moss removal service with a range of different treatments depending on your requirements to eliminate all types of Moss, Lychen and algae infections on roof slates and cement roof tiles. These treatments not only eradicate the Moss and Lychens but we will also protect your roof from reinfection for future years to come. Please Contact us for further information if you require help with your roof. Highland Moss Removal Contractors | Roof Cleaner | Lychan Removal. Tain, Dornoch, Invergordon, Alness, Dingwall, Beauly, Muir of Ord, Inverness, Ross Shire.